I love glutinous rice. It has that rich nuttiness that you don't get with normal rice. I think it is underused and undervalued simply because most people don't know how to cook it. When not prepared correctly, it will turned into a mushy mess which is not very nice at all. But all it need is a few washes and rinse to get rid of any excess starch which minimise the stickiness consistency when cooked. And the best way to cook it is by steaming as this produces a lighter and fluffier texture. 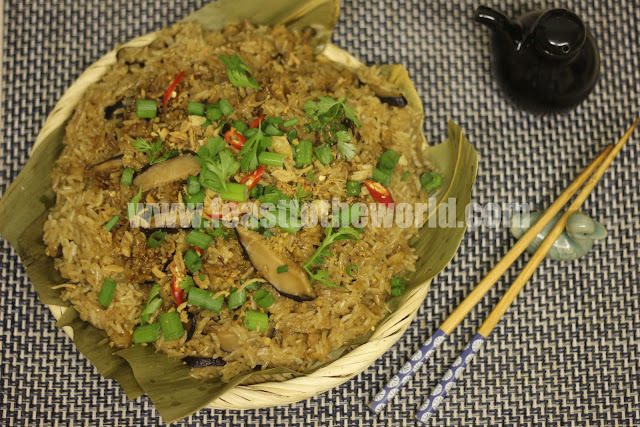 Lor Mei Fan (glutinous rice) is a common dim sum dish that showcase this sticky grains to it's full potential. The rice absorbed the flavours of the dried shrimps and mushroom when cooked and yield this delectable flavours which is rather comforting. 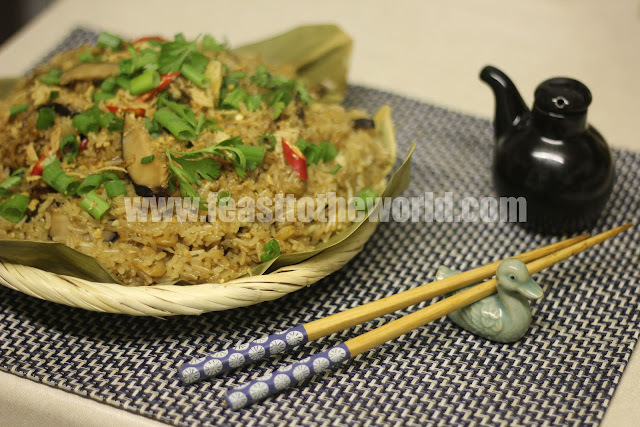 Quite often, you get a few pieces of chicken thrown into the mix and the final dish is known as Lor Mei Gai 糯米雞 (literally translated as glutinous rice chicken). In a dim sum restaurant, these are normally served wrapped in sheets of lotus leaves. The lotus leaves not only impart an additional flavour to the finished dish but also make for a grand presentation. Seeing that it's Dragon Boat Festival or Duan Wu Jie 端午節 today, I have decided to substitute the lotus leaves with some bamboo leaves instead. And due to time constraint, I did not wrapped them up like a Ba Zhang 肉粽 ( a pyramid shaped glutinous rice parcel that are normally eaten during the festival). Just like any self-respecting Singaporean who will no doubt be seen munching their way through some steaming pyramid parcel to celebrate this day, I too, shall be devouring this delicious concoction in the name of Duanwu Festival. 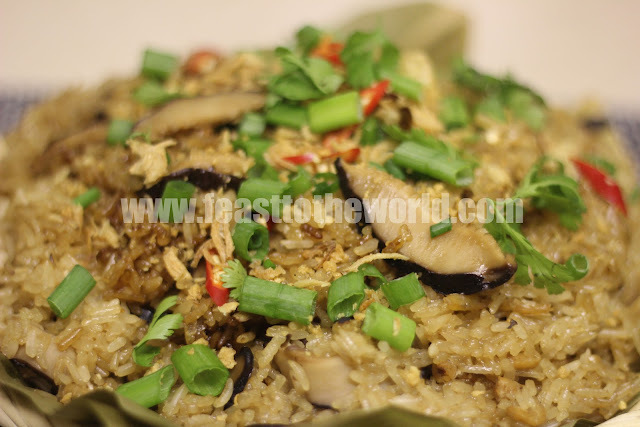 Wash the glutinous rice, place in large bowl of cold water and leave to soak overnight or a minimum of 6 hours. After this time, drain and set aside. Heat the oil in a wok until smoking. Add the garlic, dried shrimps and mushroom and stir fry for 1-2 minutes, until fragrant. 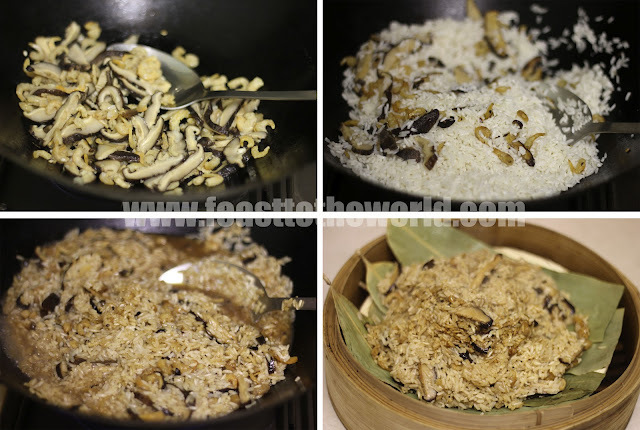 Add the glutinous rice, then the dark and light soy sauce, oyster sauce, sugar, salt, black pepper and sesame oil. Add the water and stir to mix thoroughly. Remove the wok from heat. Transfer the glutinous rice mixture to a steamer. (I have pre-lined the bamboo steamer with some soaked bamboo leaves but you can line it with either a clean towel or clingfilm if you like.) Steam for 40 minutes over simmering water and remove and transfer to a serving dish, garnished with spring onions, chillies, fried shallots and a few sprigs of coriander. oh man… just what i need… for Duan wu jie!